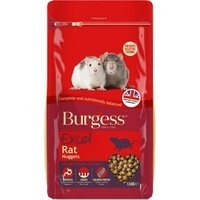 Burgess Excel Rat Nuggets is a delicious advanced Super Premium rat food providing a complete healthy diet for your rat. It is carefully manufactured from a unique blend of ingredients to give your rat all the vitamins and minerals it requires along with the correct level of protein and fibre to help your rat maintain optimum health. Loved by rats, each and every nugget contains a balanced level of the nutrients needed to keep your rat in optimum weight and condition. Prevents Selective Feeding. Excel® Rat nuggets provide a wholesome balanced diet in every mouthful. Good for Healthy Teeth. Larger Kibble stimulates gnawing. Fortified with Copper to promote good coat colour and condition. Beneficial Bacteria.Contains a prebiotic to help promote a healthy tummy. The best rat food I have ever tried with my rats. Pellet form and animal protein is a huge plus, and VetUk’s price is unbeatable.